DATE: Saturday April 30 th. BEST RAINBOW: 5lb for Mark Morris. BEST BROWN: 5lb for Mark Morris. BEST BLUE: 4lb for Mark Morris. BANK ROD AV: 11.40 fish per angler. BOAT ROD AV: 5.46 fish per angler. Sport: Just a quick note from yesterday. There were few anglers about due to the awful weather but considering that they both did well. Paul Peters landed 10 trout from Petes point. He fished a booby on a sinking line. Fishing from the dam wall was Elliot Horrocks who caught 7 fish on a dawsons nomad including a tagged fish that won him a Greys GR 70 competition special rod! Worth coming. Fishing the bank today in Hollins bay and Hollins point was Mark Morris who had great sport landing 14 fish including a brownie at 5lb a rainbow at 5lb and a blue trout weighing 4lb, cracking fish which all fell to an olive leach on a midge tip line. Tony Taylor fished from Bell point where he caught 23 trout. Tony opted for a di3 sinking line with a booby on the point and nymphs on droppers with the booby taking the lions share of the fish. David Jacks and Tim Taylor landed 17 fish between them from Bell point and at the jetty. They caught on lures and Montana. George Ashton and Jose had a super day afloat with 27 fish to their boat. George caught his fish on lures on a fast glass line whilst Jose fished a floating line with an olive nomad. They caught fish from all areas. Derek Moore and Gary Martin also had a good day with Gary enjoying his best day ever landing 10 good trout. Garys best tactic was to fish lures on a floating line whilst Derek fished similar patterns on a fast glass line. The England youth team were out on the water today for a training session with all of them catching fish. I didn’t manage to get all their returns but they all enjoyed their day. They will be out again tomorrow. Syotw. This entry was posted in Stocks Reservoir Fishing Reports on April 30, 2016 by staff. DATE: Thursday April 28 th. NOTABLE BAG: 3 fish weighing 12 lb for Mike Goldwater. BEST RAINBOW: 8lb for Mike Goldwater. BANK ROD AV: 8.75 fish per angler. BOAT ROD AV: 5.28 fish per angler. Sport: Super fishing today with a couple of areas standing out. Fishing the bank next to the jetty were fishing pals Ian Jackson and Mark Simpson who had some great sport. They both caught on Dawsons olive and green pea on floating lines, both anglers caught 12 trout and they each took a tagged fish worth a £100 tackle voucher! Good angling. Out on a boat were Hugh Fowler and David Warwick who caught 15 trout between them. They caught most of their fish in Hollins bay on sinking lines and lures. Also out on a boat were David Uff, Mike Goldwater and Bob Elias who tempted 18 fish between them. Their best spot was Grindy lawn up by the dam where black buzzers and damsels on floating lines were their best tactic. Syotw. Mark Simpson and Ian Jackson both had equally brilliant days fishing! Amazingly they both had twelve trout to 3lbs 8oz, they both caught a tagged fish and they both won a £100 tackle voucher! They are both doing the lottery tonight! This entry was posted in Stocks Reservoir Fishing Reports on April 28, 2016 by staff. Sport: We had weather from all four seasons today, but on the whole it was considerably better than the forecast would have you believe. When the breeze dropped away, as it did several times, the trout were straight up to the surface sipping emerging buzzer and the breeze picked up again they would go down again. Joan Lindsay had another 7lb rainbow today part of her 11lb 11oz bag of three. (Pictured below with its twin from last week) she caught on diawl bachs, buzzer and green pea. Ben Wile had a great day on the washing line whilst boat fishing at Grindy’s Lawn. He caught ten trout to 3lbs 8oz on buzzers and black boobies. On the shore Patrick Flatley and Tony Taylor both landed seven trout. Patrick caught his around the boat jetty area on a floating line and cat booby. He even got smashed off with a double hook up. Joan Lindsay caught another 7lb rainbow today. Picutred here with its twin from last wednesdays trip. This entry was posted in Stocks Reservoir Fishing Reports on April 27, 2016 by staff. Sport: a cold start this morning with a fresh Northerly didn’t make for inviting conditions but the hardy members of the Lancsy Lads were here in force b right and early for a day’s fishing with 6 on the boats and several more on the bank. The fishing proved tricky at first but the wind dropped and the air temp rose considerably and after a full days fishing top boat was Ged Fish and Bill Edmondson with 14 fish to the boat Bill taking 9 of the fish including a stonking 7lb 10oz brownie their best areas were the dam and the Alders with buzzers accounting for most of the fish. Also on the boats were Derek Moore and Bob Fitzpatrick who caught and released 13 fish between them on nymphs’ dries and boobies from the Northern Shallows and the dam area. This entry was posted in Stocks Reservoir Fishing Reports on April 24, 2016 by staff. Sport: It was great to see Keith Woods and his merry Carlisle Fly Tiers today. Fifteen of them in all took to the water to chance a fish or two. They did pretty well too, at 4 o’clock eleven of them returned after catching forty four trout between them. (the other four stayed out fishing) There was a really good mix of rainbows and blues brought to the scales, and the man himself caught a belting brownie of 6lbs (pictured below). He took the prize for the biggest fish which then opened up the ‘best basket’ to the rest on the field. It was snapped up by Ian McVitie with five fish for 11lbs 6oz. Ian caught eleven trout in total on a variety of methods including dries and the washing line. They also had a prize for the smallest trout of the day and Eric Little managed to weasel out a fine specimen at 1lb 9oz. It was great to see you cheers fellers. The one thing that has really changed over the last two day is that the Dam has come alive! It was by far the best area today. Rick Nuttall and Andy Cooper had 27 trout their boat and that after doing a fairly unproductive lap of the Northern Shallows. It was at the Dam where they built their tally catching on sinking lines with damsels and blobs initially, and then floating lines and bobbies when it clouded over. Good Angling fellers. It was also great to see Stuart Wardle and Mike Tinnion out on the water with the future stars of our sport. They run a talent pathway for youth anglers. They weren’t out for very long but they caught a fair few trout between them the best score was nine! The anglers out with Paul Bebb today had fifteen trout between them on green peas fished on floating lines. Their best area was Grindy’s Lawn. 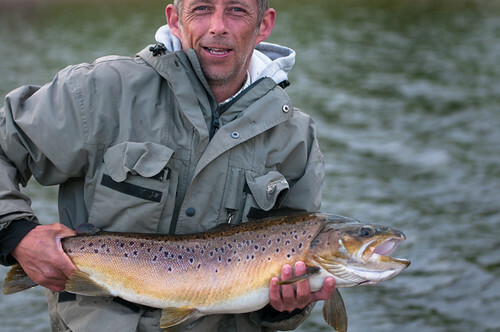 Keith Woods caught this stunning 6lb brownie on a green holo diawl bach at Curry’s Cast. It was in perfect contition. The brownie was part of Keith’s 13lb 12oz bag. This entry was posted in Stocks Reservoir Fishing Reports on April 23, 2016 by staff.